Emma Hornsby won the ladies match award. 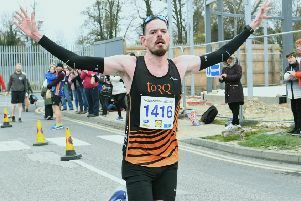 Although not quite able to hang on to their Southern League Division One title, Nene Valley Harriers at least finished their season on a high at Norwich. They won the last match by seven points and that earned them a third-place finish in the final table behind new champions Dartford and runners-up Southampton. Nene Valley’s strength in the men’s throwing events once again shone through as they dropped just two points in the four disciplines. Martin Tinker won the A string shot and discus with Ken Baker and Simon Achurch claiming the respective B string events. There was also an A string javelin success for Tomas Saunorious and a B string hammer win for Sam Wilson, and completing the impressive points haul were Isaac Huskisson and Achurch with second places in the A string hammer and B string javelin respectively. On the track, the best men’s performance came from James McCrae as he raced home first in the 800m A race. There were five wins on the track for Nene Valley’s ladies. They cleaned up in the 100m hurdles as trainee nurse Maria Hollingsworth, who travelled from her job in Manchester for the match, won the A race and all-rounder Emily Maltby the B race. Lily Hughes (100m B and 200m A) enjoyed a sprint double and Devon Spencer was first in the 400m hurdles B race in 76.6. Maltby also went on to record wins in the long jump and triple jump and a second place in the 100m while Spencer also picked up another victory in the triple jump. Becki Hall and Lydia Church gained maximum points in the shot and also recorded seconds in the discus and hammer respectively. Emma Hornsby won the long jump with 5.86m and, for the second meeting in a row, that earned her the ladies match award.